I mentioned that I hadn't golfed since lifetime gym over twenty years ago. Yesterday, on a blustery day in Fenelon Falls, I played the nine hole course at Eganridge Inn and Spa overlooking beautiful Sturgeon Lake with my buddy Elvis, courtesy of Chevrolet. Things got off to a rocky start when I thought I needed to rent left-handed clubs but was assured by the golf pro that I was likely right-handed. I shoot left-handed in hockey, but bat right-handed in baseball, and I'm honestly not sure which feels more natural with my golf swing. 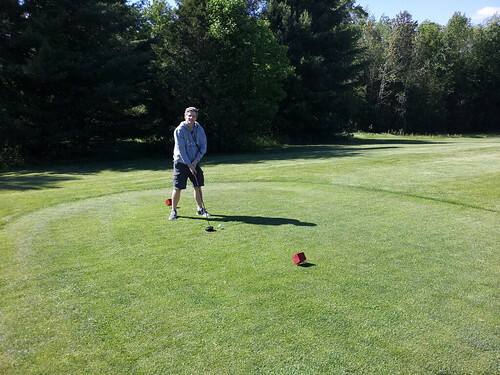 With my right-handed clubs, I did my very best. 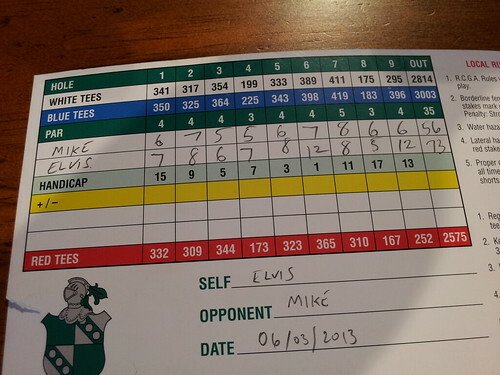 Golf is a humbling game, and although I won handedly, I'm sure you'll have a good laugh at my score of 56. You played from the reds? Never understood right handers. They shoot left, catch left, but then they golf and bat right. Left hander- I shoot, bat, golf and catch right. The hand placement is the same for stick, club and bat. If you shoot left and bat right, how do you bunt? The bunt grip is more like a stick grip so a righty would have to bunt left? Makes no sense. I spent every summer of my life until I was 20 in Fenelon Falls.. our cottage was on the Burnt River just between Coboconk and Rosedale. My aunt and uncle still have their cottage on Sturgeon (Fenelon side) which has turned in to the 'family' gathering place. There are only awesome childhood, teenage and now grown up memories... Im glad your front 9 show good times too!